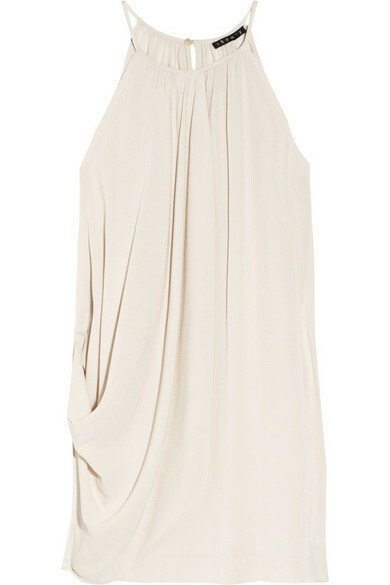 We love Theory's easy-chic pieces, and this draped cream stretch-silk camisole is storming to the top of our wish list. Wear it to soften the lines of classic tailoring, with the high neck acting as the perfect counter to thigh-grazing shorts. Shown here with: Sonia Rykiel jacket, Eddie Borgo cuff, DANNIJO cuffs, Pamela Love ring and ring, Theory shorts, Theyskens' Theory shoes, Alexander Wang clutch. Theory Terabi camisole: cream stretch-silk, ruched, asymmetric draped overlay, split at back. Button fastening at back. 93% silk, 7% spandex. Dry clean. Designer color: Warm Birch.